Dollhouse Decorating! : Making your own dollhouse furniture? Here's some measurements for you! Making your own dollhouse furniture? Here's some measurements for you! This is exactly what I have been looking for! Thank you. I'm building my daughter a doll house for her 18 inch doll. I would like to make my own furniture. How would I go about figuring the measurements to do something like this? Thank you in advance for your time and any help that you could offer. Measure an object or room in inches, divide by 3 and make your doll object or room that many inches. 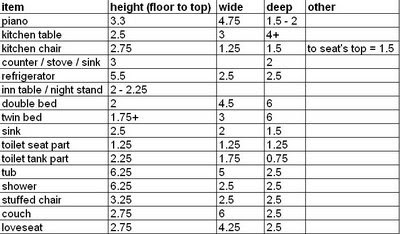 For example, if your table is 30 inches high, 30 divided by 3 is 10, so you'd make your doll table 10 inches high... hope this helps! Good luck!